For starters, you should carefully think over your theme – this is the first thing you have to do before opening a restaurant. What features will your restaurant have that will help this place stand out from the competition? What kind of cuisine will you be serving? If you come up with specific (not general) answers to these questions, you might already get some ideas on potential decoration trends. Once you have chosen you theme, the choice of dining tables for a restaurant material will be easier. If you are going with a traditional theme, consider wooden tables; if you are working on an exquisite and modern atmosphere, take a look at high gloss or tempered glass models; some truly sophisticated environments may even benefit from marble tables. Sure, opening a new restaurant is a costly undertaking, and it is essential to consider every expense point. Plus, you should not forget that some unexpected expenses will probably be required, too. On the whole, you should establish the amount you would like to spend, as well the maximum budget you can afford – as a rule, those are two different figures. Some market research will help you stay realistic. Even if your budget is limited, you should never compromise on quality of dining tables for a restaurant – not only your clients will be able to see the difference, the life of such furniture will also be shorter. Even though constant cleaning is necessary, it takes a toll on restaurant furniture. So, choose models that are easy to maintain and that are resistant to moisture and soaps. Finally, choose furniture that can be replaced in case of damage. As a rule, neutral colours and shapes are better, because they can be substituted easily. If you are still looking for a good store to shop at, take a look at Furniture in Fashion . In the UK, this is one of the best platforms to place your orders. First of all, it offers generous discounts for bulk purchases (which is usually the case while shopping for dining tables for a restaurant), as well as special promotions on selected items. And, another important thing is that the store delivers all orders, even the bulkiest ones, within 10 business days, which is way sooner than the majority of e-commerce platforms can offer. 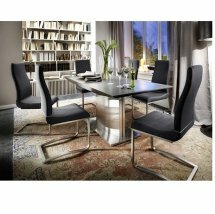 Thinking of Buying a Dining Table Set Online?